Engaging in arguments and debates in the international domain over the number of civilians who may have died at a particular time in the country will not help resolve any issues, in a meaningful manner, locally, except a feel good factor for a few individuals who may think that they have won a debate or scored points over someone or the other. Debates in the international domain are exactly how the international community, which includes the UN and other international organizations, strive to reflect pluralism, obtaining the multiple perspectives of their members in order to reach decisions, either by reaching consensus or through a vote. There are debates which may lead to negotiations and eventual consensus or arguments which lead to a decision through a vote. Debates and reasoned, fact-based argumentation are necessary procedures when a State defends itself as it must, against glaring falsehoods. It is not something a State can avoid, resentful that a few individuals may feel good about it. The figure of forty thousand civilian casualties during the last stages of the war in Sri Lanka has been contentious from the moment it was asserted. Repeated use of it by those interested in pushing this unverified figure gained momentum until it became accepted as a credible number in most of the Western media, after it was mentioned in the UN Secretary-General’s Panel of Experts’ report, aka the Darusman Report. Most recently, Lord Naseby, speaking in the British Parliament on the 12th of October 2017 has disputed this figure which appeared in the Darusman report,while pointing out that most of the war crimes charges flowed from it. He refutes this figure and the claim that civilians were willfully targeted, using dispatches from the British Defense attaché Lt. Col Anton Gash stationed in Colombo, to the Foreign and Commonwealth Office in London,together with the UN reports of the relevant period. The figures of civilian casualties cited are very clear, and they don’t exceed 8,000 (eight thousand). The difference between this and the forty thousand figure is a whopping 32,000 human lives. The Sri Lankan Foreign Ministry’s assertion that “engaging in debates and arguments over the number of civilians who may have died at a particular time in the country will not help resolve any issues”is specious to say the least. “The number of civilians who may have died”has a critical impact as regards the principle of proportionality, which is relevant in arriving at an opinion on whether a State has deliberately used excessive force or used excessive force at all. Surely it is the duty of the Government to debate this issue in the international domain using the evidence presented by Lord Naseby just a few days ago,based on confidential documents even if massively redacted, which were not available in the public domain prior to this point? The Marga Institute’s publication,Narrative Three-The Last Stages of the War in Sri Lanka, the principal author of which was the distinguished senior-most retired civil servant Dr. Godfrey Gunatilleke, states that the “estimates of civilian casualties hinge on the estimate of population in the Wanni before the war…” which the publication says were a “rough census” carried out by the AGA. Narrative Three concludes that “there are major inconsistencies in these estimates which have been pointed out by experts”. It further reveals that these figures have been “challenged on the ground that they have been prepared under the direction of the LTTE and are highly inflated for the purpose of obtaining rations and assistance under government welfare programmes as well as magnifying the scale of the humanitarian disaster that could occur”. An extensive study of the casualties in the period January to May 2009 was carried out by an independent UK based group of scientific experts of Sri Lankan lineage, which resulted in a publication called The Numbers Game: Politics of Retributive Justice. This report was exhaustively discussed at a conference organized by the Marga Institute and chaired by Dr. Gunatilleke. After examining the available evidence including satellite imagery, the report estimated the total number of civilian casualties from January 2009 to May 2009 at a figure which did not even begin to approach the mythical 40,000. …one organization, whichdid not differentiate between civilians and LTTE cadres, recorded 6,710 peoplekilled and 15,102 people injured between January 20th and April 20th 2009. These numbers were presented with a caveat, supported by other sources, that the numbers actually killed and injured are probably higher. UN agencies, working closely with officials and aid workers located in theconflict zone, documented nearly 7,000 civilians killed from January to April2009. Those who compiled these internal numbers deemed them reliable to the extent they reflected actual conflict deaths but maintain it was a work in progress and incomplete. Some three weeks before the war ended, Reuters reported as follows: ‘A U.N. working document, a copy of which was obtained by Reuters, says 6,432civilians have been killed and 13,946 wounded in fighting since the end of January’. …derived independently from eyewitness testimony and information from aid workers, are that at least 10,000 civilians were killed. Considering that there are all these numbers from varied sources, apart from the 40,000 in the Darusman Report, which itself doesn’t suggest it as a final figure, one would think that any new evidence that helps to arrive at the truth is certainly worthy of debate and engagement, especially at the UN Human Rights Council. The Paranagama Commission report was produced well before UNHRC Resolution 30/1 was co-sponsored. However it was presented to Parliament by the Prime Minister only after Resolution 30/1 had been adopted, preventing its useful insights from being presented to the Human Rights Council in time. It is doubtful whether the detailed analyses contained in it have been used as yet by the Government to counter some of the inaccuracies circulating in the international arena regarding the last stages of the war. 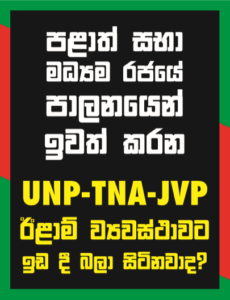 Given his oft-repeated public stand, it is difficult to believe that President Sirisena is of the view that the numbers of civilian deaths should not be debated in the Council in Geneva despite Lord Naseby’s new and credible information (in that it comes from external i.e. non-Sri Lankan sources uninvolved in the conflict), when numerous civil society groups continue to insist at every UNHRC session that large numbers of civilians were deliberately targeted and killed, some even claiming genocide. The Foreign Ministry seems to have decided not to use this information internationally until the government gets around to the “100 Day Programme (point 93)” and its “own set of national proposals for a transitional justice process” is eventually set up and gets going. Is it the view of Foreign Minister Marapana and State Minister for Foreign Affairs Vasantha Senanayaka, that if there’s the slightest chance of bringing new evidence before the international community to assist it in arriving at the truth amidst a barrage of false propaganda against this country internationally, that they should refrain from doing so because the considered view of the Foreign Ministry is that it would not help “in any meaningful way, locally”?